ClearCare can match caregivers based on client criteria with a single click! And you can email/text the matching caregivers right from the system. Matching happens as soon as you enter the client’s name in the Scheduling tab… No more manually entering filtering criteria every time. The larger your agency is, the harder it is to match clients and caregivers. ClearCare can support you whether you have 10 or 10,000 clients. That’s it! 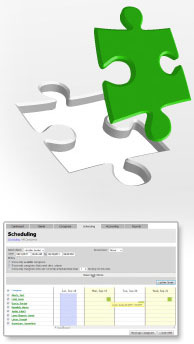 Now, when you click on the “Scheduling” tab, you simply have to click on the client name and it matches them automatically. Send matching caregivers an email or text message by clicking the checkbox next to the name(s) and click “Message Caregivers”.